Imphal, Aug 6 : A 48-hour general strike imposed by Joint Committee of Inner Line Permit System (JCILPS ) students wing affected life in the state for the second day today. Reports of clashes between strike supporters and police are pouring in from all parts of the state. All main roads and by-lanes were barricaded to stop movement of vehicles. The state has been witnessing turmoil since July 7 following demand to pass a Bill to check influx of immigrants by introducing Inner Line permit system which is prevalent in other neighbouring states. Due to massive influx of immigrants from neighbouring countries like Nepal, Bangladesh, Myanmar and other parts of the country, the population of tribals has been exceeded by outsiders. It was feared that within the next few years, the indigenous population will become a minority like it happened in Tripura and Sikkim. As protesters came out in large numbers stopping movement of vehicles and people, police resorted to heavy firing to disperse them. In spite of the firing by police, protestors continued to come out in hundreds shouting slogans. The police used water cannons, tear gas shells, rubber bullets to control the stir. Sounds of firing were being heard since last evening. All streets looked like a war zone. Educational institutes remained closed since the first week of July due to the crisis. 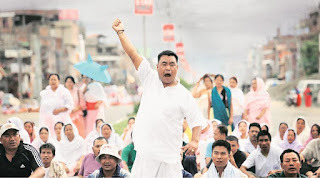 Human chains were also formed shouting slogans for punishment of killing a student Sapam Robinhood in police firing. They also shouted slogans demanding punishment to police men for allegedly beating up girl students. Police officers were allegedly involved in brutally beating up girl students who took part in the stir. Meanwhile, the state government has prepared a Bill to be introduced in the state Assembly. It was likely to be discussed by the state Cabinet soon.